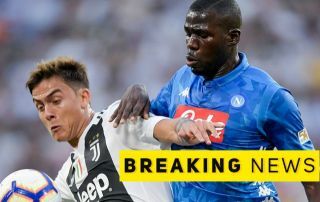 Manchester United reportedly ‘dream’ of sealing the transfer of Napoli defender Kalidou Koulibaly and could launch a special move for him this January. The Senegal international is one of the best players in the world in his position at the moment, and would clearly make a great fit at Old Trafford to provide an upgrade on the likes of Chris Smalling and Phil Jones. Despite Ole Gunnar Solskjaer’s uncertain future as he comes in as interim manager until the end of the season, it seems United could be ready to make an exception with a big-money bid for Koulibaly this month, according to France Football magazine, as translated by Sport Witness. The report suggests the Red Devils could fork out as much as £89million for Koulibaly, and it would be interesting to see if that could persuade Napoli to sell. The Serie A giants will undoubtedly not want to lose one of their most important players in the middle of the season, but that kind of money could be hard to turn down. Napoli have also lost other star names in recent times, with their former manager and midfielder Maurizio Sarri and Jorginho both moving to Chelsea in the summer. Star striker Gonzalo Higuain was also snapped up by rivals Juventus a couple of years ago, and United have a solid recent record of getting the players they want.